The Blazer® Vane, with its unique design, begins steering and correcting immediately, making believers out of bow hunters and target shooters alike all over the world. The combination of the steep leading edge angle and material stiffness enables the air to flow over the vane in a manner that actually creates lift. The Blazer® Vane, with its unique design, begins steering and correcting immediately, making believers out of bow hunters and target shooters alike all over the world. The combination of the steep leading edge angle and material stiffness enables the air to flow over the vane in a manner that actually creates lift. This leaves the tip of each vane inside undisturbed air, similar to the drafting principle used in auto racing. 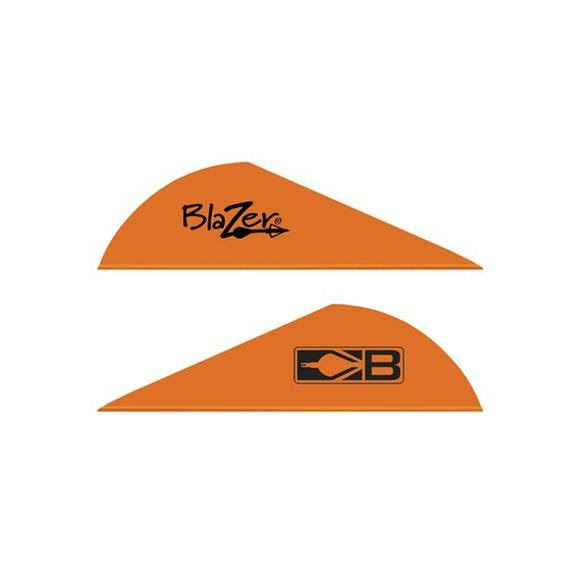 This airflow created by the precise leading edge angle allows the tip of each vane to act like a rudder, which is noticeable at longer distances with the flatter trajectory Blazer® Vanes provide. Bohning ® has optimized the steerage capabilities and overall performance with tighter tolerances, making the BlazerÂ® the lightest, high performance broadhead vane ever produced. Well-known bow hunter Jay Gregory says, &apos;The coolest thing is with all the different options in colors and patterns in Bohning® wraps and the awesome Blazer® vanes, you can personalize your own mystical flight of the arrow!&apos;. The best hunting vane on the market!